This essay first appeared on January 1, 2017 in the Herald-Sun. WRAL radio began playing Christmas songs around Thanksgiving. I have been singing favorites and learning new ones. One song from 1966 had never fully registered in my brain until this year. It was beautifully written by Ron Miller and made breathtaking by Stevie Wonder. A person named Lacey Sawyer created a YouTube montage for the song. Her tableau combines with the words in my mind. “Someday at Christmas there’ll be no wars, when we have learned what Christmas is for” overlays images of American soldiers climbing over rubble and making peace signs with what appear to be children in Iraq or Afghanistan. The video includes men in loud lamentation at a protest, perhaps from the Arab Spring (2011). Sawyer has pulled together photos that evoke Middle America and the Middle East, as people in Marine uniforms hand out “Toys for Tots” and two women grasp hold of a man in uniform, perhaps returning from the Middle East. Miller’s lyrics and Wonder’s voice together were originally a prayer for a world without war, where “all men are equal and no man has fear.” This prayer from 1966 intertwined voices crying out against war in Vietnam and voices calling for Civil Rights. I have been layering this prayer with another song, from 1989, called “Fight the Power.” At the beginning of their song, Public Enemy includes these words from a 1967 speech by Civil Rights leader Thomas N. Todd: “Yet our best trained, best educated, best equipped, best prepared troops refuse to fight. Matter of fact, it’s safe to say that they would rather switch than fight.” The hope that Mr. Todd spoke of in 1967, the same year Stevie Wonder’s album debuted, was that people told to kill would refuse to do so. Playing off a cigarette ad, Todd paraphrased a prophecy from the prophet Isaiah. Todd evoked a world where troops would refuse to fight – a world where swords were switched into plowshares – and this hip-hop group brought his words to bear again in 1989. Someday at Christmas, there’ll be no wars; our best will refuse to fight. Egypt’s powerful military said yesterday it would not open fire on protesters as a coalition of Egyptian opposition groups called for a million people to take to Cairo’s streets today. ‘To the great people of Egypt, your armed forces, acknowledging the legitimate rights of the people … have not and will not use force against the Egyptian people,’ an army statement said. 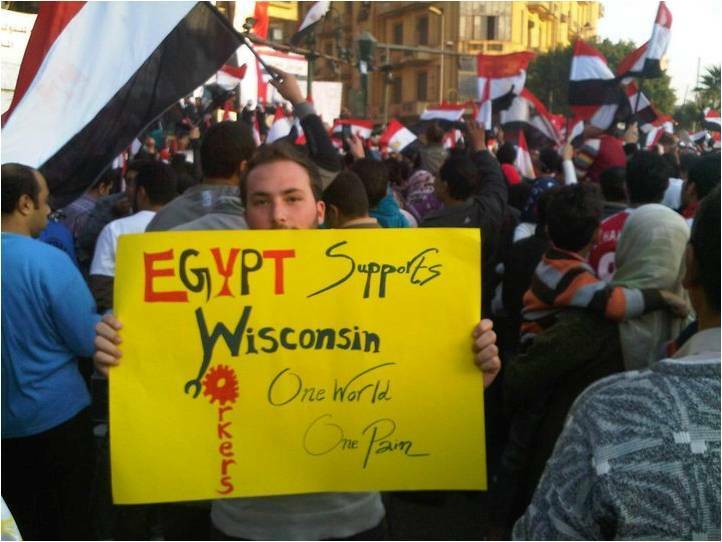 The concerted opposition action signaled the emergence of a unified leadership for the protests demanding the removal of the president, Hosni Mubarak. 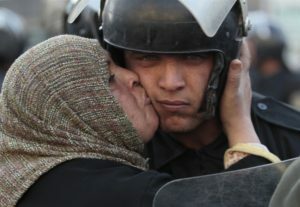 A powerful image from Lefteris Pitarakis of the AP shows an Egyptian woman kissing an officer who could be her grandson. The NBC news ran these words: “An Egyptian anti-government activist kisses a riot police officer following clashes in Cairo, Egypt, Friday, Jan. 28, 2011.” Something akin happened in Wisconsin that same winter, as police officers joined hands with protestors against Governor Scott Walker.